Applied Materials said it expects semiconductor sales revenue to grow 7 percent in the current quarter, well short of the 13.8 percent boost expected by the Street, according to FactSet. As a barometer for the rest of the industry, Applied Materials’ top customers include other large multinational companies like Samsung Electronics, Micron and Intel. Micron and Intel shares also fell Friday. The disappointing guidance drew critical comments from Goldman Sachs analysts, who downgraded the company’s shares to neutral from buy on Friday. “We downgrade Applied Materials from buy to neutral as we reduce our estimates and price target to reflect the underwhelming market share outlook in the core Semi Cap Equipment business, worse-than-feared fundamentals in Display, and a muted gross margin outlook,” analyst Toshiya Hari wrote. Hari, who emphasized Goldman remains “constructive” on Applied Materials’ competitive positioning, nonetheless cut the company’s price target to $58 from $65, implying 7 percent upside over the next 12 months. 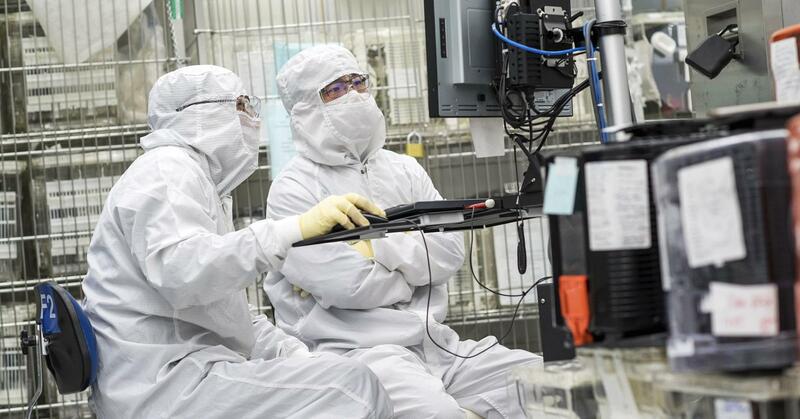 Despite the lackluster guidance, Applied Materials did post second-quarter results that beat consensus expectations and offered upbeat comments looking forward for the business as a whole. The company reported adjusted earnings per share of $1.22 versus expectations of $1.14, while revenue of $4.57 billion topped forecasts of $4.45 billion. 0 responses on "Shares of chip industry barometer Applied Materials drop most in 9 years"